Rygnarok is a web-based development environment for newsletter and emailing specialists. It starts where template-based solutions stop – by letting developers harness a powerful newsletter building framework to build custom layouts with the best possible efficiency. We know how demanding a field like online marketing can be; it does not matter how complex the emailings are that you have to build for your clients: it has to be done fast. Rygnarok was built on those needs, and as such gives you all the tools to work fast and well. Rygnarôk is made for developers: the framework at its core is intended to facilitate the development of newsletters without any tradeoffs in flexibility. Your developers will have a powerful, mature API at their disposal that is easily extensible to both the needs of your developers and those of your clients. Creating newsletters is a trade in its own right, and creating quality layouts compatible with the largest possible panel of email clients is paramount for effective communication. Rygnarôk’s toolset generates optimized code with added functionality to help your developers build solid layouts. Your quality assurance teams will appreciate the dedicated, automatically generated summaries that allow verifying at a glance the links and alternate texts used in a newsletter. Your developers can easily extend these summaries with custom content relevant to your clients. The blocked images preview and local archives make quality assurance a breeze. Rygnarôk is primarily a newsletter development framework intended for professional newsletter developers. While it has a UI, the UI represents only a small part of the package. Most of the work is done behind the scenes by the developers themselves, with the help of Rygnarôk’s extensive API. We have developed it for our own use over the course of 4 years, so it is a mature package that can get you productive instantly. Rygnarôk generates the final HTML files on the fly from the individual content blocks your developers create. The newsletter frame (common HTML structure for every newsletter type) is handled separately, so changes to the frame can easily be applied to all newsletters using it. It also makes shuffling the order of content blocks around that much easier, as it does not involve copying whole blocks of HTML around. Rygnarôk natively supports creating newsletter variants, to create several versions of the same newsletter for different audience groups. There is no need to maintain several HTML files; any change done in a content block is automatically applied to all variants. 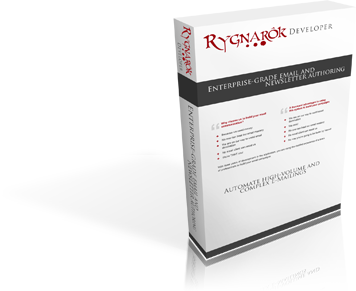 Developers can of course harness the full power of Rygnarôk’s API to handle complex scenarios. Rygnarôk offers the full advantages of a mature HTML building framework without forcing your developers to work in a specific way. The framework features are fine-grained enough to be adaptable to virtually any situation. We have been creating E-Mailings for long enough ourselves to know that custom HTML is often still necessary – template-based systems will only get you this far. Rygnarôk is built to be adaptable to whatever requirements your customers’ business models may have: your PHP developers can hook custom classes and functions into the system to add custom functionality and content to the generated HTML files as well as the report files. HTML and plaintext filters allow for fine-tuning of the generated HTML code. Rygnarôk’s approach to building HTML is to provide a framework of HTML building helper functions, and let your developers use this function pool to be more productive while keeping complete freedom in the HTML structure they build. These functions are made to create optimized HTML code that will look good in any email client. Rygnarôk ships with functions to create for example: bullet lists, images, links, facebook and twitter sharing links and more. Productivity is key, and this is the area in which Rygnarôk excels: your developers can extend the system to automate any recurring layout blocks or functionality. Every emailing frame can have its own set of automated content blocks or share common content blocks with other frames. Option-based development allows for custom switches anywhere with levels of control down from newsletter-wide options to variant-specific options. This way your developers can easily switch between different layout sets with a single option. One of Rygnarôk’s development philosophies is to centralize some data so it can be easily changed. Good examples for this are font style and color definitions: they can be set individually for each frame, and they are automatically used by all helper functions based on them. If your client wishes to change the typeface used in his mailings, you will only have to change this in one location. Rygnarôk also allows creating style presets, which you can then specify when using a helper function to use that set of styles instead of specifying them individually for each function. Rygnarôk offers a set of HTML tags that automatically generate optimized html code for common use cases, or to make sure existing tags (like the problematic <p> tag) display correctly in all email clients. Some examples: <nowrap> (makes sure the containing text does not get split to the next line), <quote%gt; (surrounds the containing text with country-dependent pretty quotes), <font> (creates a font tag with the default font face, size and color), and many more! A global summary for all variants with all links, tags etc. All these files are additionally packed together in a ZIP file, including a local version with images to view the newsletter offline that can be used to archive it. This ZIP file is ideal for sending the newsletter to your client so he can do some quality assurance of his own before it is sent out. With the integrated tag manger, you can set tags for each newsletter. A dedicated screen helps find any newsletters that have not been tagged yet and edit them directly. Tags can then be used to easily find matching newsletters via the UI, and the online database also uses tags to help your clients find newsletters. To make tracking changes made to newsletters easier, Rygnarôk enables developers to add change log entries that automatically increment the newsletter revision. This revision number as well as the complete change log are then included prominently in the reports. Dedicated to your clients, every Rygnarôk installation can optionally be tied into the online newsletter database to allow your clients to log in and review all the newsletters you have built for them and download the archived ZIP files. Featuring extended search tools including a search by tags, this service can be a valuable addition to your existing set of newsletter services. If your media server used to host the newsletter images is accessible via FTP, you can configure Rygnarôk to be able to upload and update the images on the server directly via the UI. Once you have defined your folder structure, the correct path will also be determined automatically. Depending on the software your clients or yourself use to send newsletters, chances are that you will have to use a specific syntax for links or variables. Rygnarôk abstracts link and variable management so you do not have to think about it; you only work with raw links and variables, and the framework converts them automatically. Rygnarôk automatically generates a plain text template from the HTML contents of the newsletter. This includes image and link alt attributes so no text content gets lost, and any links themselves are also used. To gain even more time, your developers can use the plaintext filters to pre-format the plain text output according to your client’s specifications, for example by automatically formatting headers and lists. The generated HTML code is automatically checked for any errors, and the integrated source viewer allows to quickly finding where the error occurred. In many cases, building layouts based on images is inevitable. To ease the handling of images containing large amounts of text including links, Rygnarôk offers the built-in sliced image API. It creates the HTML code automatically using a simple file naming scheme, and even supports distributing the alternate texts over the individual images so the tooltips stay correct. Note: Rygnarôk is intended to be installed locally on a developer machine. Scales to your needs with volume pricing advantages. Licenses are perpetual, and include 1 year free support and updates. Support and updates are renewable every year. Contact us for a quote for your use case.